The amazing canines from the Border Collie International Performing Canine Team are coming to Vernonia! Since 1994 BCI has uniquely educated and entertained kids of all ages through demonstrations of football, basketball, baseball, soccer and world class Frisbee tricks. This event is happening courtesy of the Vernonia Public Library Summer Reading Program. Make sure to join us at Hawkins Park at 6pm, alongside the beautiful Rock Creek. Come early to take a refreshing dip in Dewey Pool. As a courtesy to the performers, no outside dogs will be allowed at this event. Thank you for understanding. Have you ever wondered about the life of a pioneer in Vernonia? At 6pm on Thursday the 25th of June there will be a 1 hour presentation in the Vernonia Public Library on the first and second generations of the Weed Family. This will trace them from the Civil War period to their efforts in carving our a life in the Nehalem Valley wilderness. The presenter, Tobie Finzel, has been a member of the Vernonia Pioneer Museum Association for over 10 years and has been writing regular articles on Vernonia history for the local newspaper for just as long. The talk will include information about the Weed family, their impact on life in Vernonia, as well as pictures of the family and their environment. This presentation is part of the VPL Summer Reading Program, and is part of a regular series of events that are happening this summer. Many classic coming of age stories involve fishing, featuring idyllic interaction with nature as part of the ultimate childhood. The process of learning how to catch a wary trout parallels the journey to adulthood. Quite a few people have speculated that David James Duncan ‘s The River Why is based on the Nehalem River. 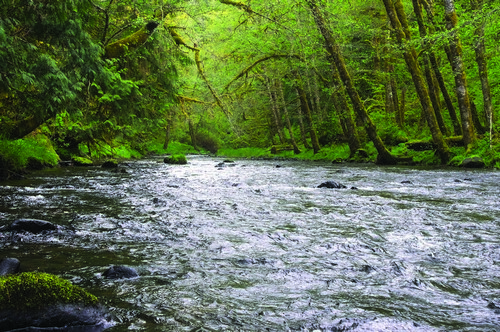 The Nehalem is a great fishery for both resident and sea-run cutthroat trout, featuring deep pools and long riffles. Vernonia is located at the junction of Rock Creek and the Nehalem River in the North Coast range of Oregon. Ninety miles from the ocean, most salmon are wearing their spawning colors when they arrive, so be sure to make a special salmon watching trip in October to catch a glimpse. Anglers concentrate on the main stem from January through early June, and then move to the larger tributaries in the heat of the summer. The Nehalem River will support drift boats during the winter flows, and tends to clear quickly after a rain. Spring fishing will have to take place in shallow water craft, preferably something sturdy enough to bang around some rocks and fallen trees. With human populations clustered at various points of the river, there remain stretches where the only spectators are bald eagles and scared squirrels. Rock Creek originates in the heights of the coast range and then travels east over 26 miles before dumping into Vernonia. It is host to native populations of cutthroat trout, both coho and chinook salmon, and steelhead. The catch and release fishery for steelhead is spectacular with a fly or light tackle, as the big fish will challenge even the most skilled angler. My favorite spots in Rock Creek are off road, and can only be accessed by exploring the gated logging roads. Look for access through ODF roads and via the Rock Creek mainline. The owners of True Value Hardware in Vernonia have been fishing the steelhead of Rock Creek for decades and might share a tip or two when you visit their Bridge Street store. Anglers can also visit Vernonia Lake, just to the east of downtown Vernonia. This lake is actually the millpond for the long closed Oregon-American lumber mill, and the path around was the grade used by steam locomotives delivering old growth logs from the forests to the mill. Evidence of this history is easily seen around the Lake, and there are interpretive signs for the inquisitive. The Lake has excellent access, with two fishing platforms that are ADA wheelchair accessible, as well as a boat ramp. No gas powered motors are allowed, and it’s small enough that a canoe or small rowboat is the ideal conveyance. The 34 acre lake is well stocked by ODFW with over 12,000 rainbow trout each spring. They will also drop off brooder trout occasionally, and there is a strong warm water fishery in summer that includes native population of bluegill, perch, largemouth bass and crappie. Looking for place to hold a quaint wedding and reception in the country? How about a business meeting or some type of retreat ? Do you have a family reunion, bridal shower, or surprise birthday party you need to plan? Vernonia has several venues that might be just right for your upcoming event. The Cabin in Vernonia, formerly known as the Scout Cabin and managed by the Friends of the Scout Cabin, is a beautifully restored log cabin nestled among huge trees in Vernonia’s Hawkins Park. The Cabin has a full kitchen, river rock gas fireplace, wrap around deck with tables and seating for 100 people. Hawkins Park features a gazebo perfect for taking your wedding vows. The Cabin in Vernonia is also accompanied with a wonderful story about its history. Built in 1928 and used by local Scout troops for decades, the cabin was obtained by the City of Vernonia when it fell into disrepair in the 1980’s. It sat unused and was then further damaged in 1996 by a severe flood. A group of local volunteers, spearheaded by longtime resident Shirley Daughtry, organized the Friends group, developed a business plan, raised funds, and rebuilt the cabin over a three year period. The end result is a handsome and functional community center that hosts youth activities, town meetings, and other special events. The Friends of the Scout Cabin rent it out and continue to maintain the venue with the proceeds. Cedar Ridge Conference and Retreat Center sits in the hills just outside Vernonia on twenty-eight acres along Rock Creek. Originally constructed in 1963 as a basketball camp, this staffed full service facility boasts a kitchen and dining area, a 1200 square foot conference center, lodging, a swimming pool and lots of open outdoor space. Owned by formed Portland Trailblazer and 1977 NBA Champion Larry Steele, Cedar Ridge continues to host basketball camps each summer, along with corporate picnics, weddings, retreats, youth camps, and more. The Steeles are particularly proud of the outdoor wedding chapel located at the north end of their property. “That section of the facility has always stayed pristine,” said Larry, noting that he only recently decided that the best use was as a natural chapel. The giant cedar and Douglas fir tower overhead, allowing sunlight to filter through while still creating a foliage roof. Parking is convenient, and the facilities for pre- and post-wedding activities sit just out of sight of the chapel. 2014 was a very good year for real estate sales in Vernonia. According to local agents 2015 looks like it will be even better. “The real estate market in Vernonia has changed dramatically since 2013” says Sharon Bernal, a local broker with John L. Scott Realtors. Bernal handles numerous Vernonia properties each year as well as other properties around the tri-county area. In 2014 a total of seventy-seven real estate transactions took place in Vernonia and Bernal says she had her best year ever, closing sixty-six transactions; thirty-four of those were in Vernonia. According to Bernal, the region’s real estate market reached it’s peak in 2006 and then hit bottom in January of 2013 during the recession. During that time Bernal says homeowners lost forty percent of their property values. “We never thought it would go down as far as it did,” says Bernal. The market has been slowly recovering through 2013 and then really turned around in 2014. In general, prices in Vernonia are usually lower than the rest of the tri-county region, a trend which tends to drive buyers to the Vernonia area when prices start to rise. Bernal said the average price of properties she sold in Vernonia in 2014 was $160,000. Vernonia is close enough to Hillsboro and the jobs in high tech and other industries, making the thirty-five minute commute with almost no traffic very appealing. 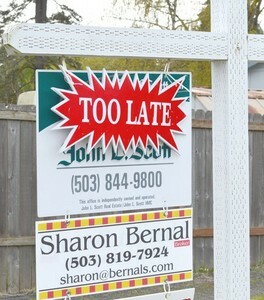 “Our problem in Vernonia now is having enough listings,” says Bernal. Bernal says another draw is the local school. She says families are tired of their children being just a number in the large districts and find the personalized attention and involvement of staff in the smaller district setting as “a difference of night and day.” The new LEED platinum, energy efficient campus is also a selling point to younger families. Easy access to outdoor recreational activities makes Vernonia a great choice for families and young adults as well, with rivers, streams, timberland, parks and trails practically in the backyard. “They can get on their bikes or motorcycles and go,” says Bernal. Although Bernal says young families make up the majority of her buyers, the new health clinic facility and twenty-four hour ambulance service also makes Vernonia appealing to retirees. Property taxes are much lower in Columbia County, which is an additional bonus. “There is no comparison to the tri-counties,” says Bernal. Purchasing and living on acreage is also a motivation for some buyers. According to Bernal bank lending on bare land has loosened up and is currently more readily available. Bernal noted that she had some recent clients in their fifties who were both raised on a dairy farm. They were looking at an early retirement and considering starting a farm in Vernonia. Bernal said she asked them, “Why Vernonia?” “They said the prices were still reasonable and the weather was perfect for a dairy farm,” said Bernal. She added that the most desirable properties – one and two acre lots – are hard to come by, but five and ten acres parcels are starting to make their way back onto the market. There are several small, new developments being constructed in Vernonia right now which are attractive to some potential buyers. “New construction seems to be moving pretty good,” says Bernal. As an example she mentioned a new home in the Knickerson Ridge development, a custom four bedroom home on a 7,500 square foot lot with plenty of parking and an oversized two car garage, listed at $229,000. “That house in Hillsboro would be listed at $289,000,” says Bernal. “People are driven to come out and look at that property.” Other small subdivisions with new homes are located on Fourth Avenue and in Roseview Court. Bernal says there are some attractive commercial properties available in Vernonia which have been drawing recent attention, including several in the previously mentioned downtown corridor. “People are interested and they are looking,” said Bernal. Stub Stewart State Park: Come Play! If you haven’t visited L. L. Stub Stewart State Park in the last few years, you should make plans to do so soon. Since its grand opening in 2007 Stub Stewart State Park has seen many changes and the addition of many services and recreational attractions. Located just ten miles south of Vernonia on Highway 47, the park is a great place to go spend a few hours, a day, a weekend or longer and is great to use as a base camp for local day trips; there is plenty to do in this corner of Oregon. 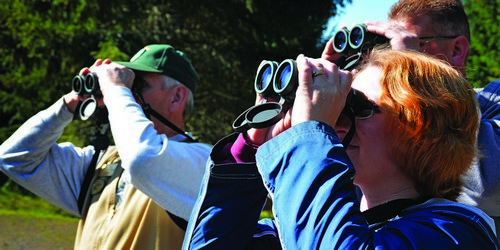 Volunteers assist a family in identify native birds inhabiting Stub Stewart State Park. The park features interpretive programs during the summer months, with ranger led hikes, programs for children and more. Visit the Discovery Depot to find out more about interpretive programs, learn about the history of the region, and pick up park information. Camping: The camping loops at Stub Stewart sure look different from when they first opened in 2007. Two camping loops offer over 75 spacious RV sites with full hook-ups and 12 walk-in tent sites; these loops have flush toilets and hot showers. A play structure has been installed in one loop. The sites are large and spacious and provide a great place for the whole family to relax, play and more. Brooke Creek hike-in camp is just ¼ mile hike into a grove of large, tall trees for those who prefer a primitive camping experience; communal firepits, pit toilets and water are available at Brooke Creek Campground. Hares Canyon Horse Camp has 15 full hook-up sites with horse corrals, flush toilets and hot showers. Mountain Dale Cabin Village offers 15 single and double room cabins (starting mid-June 3 cabins will be pet friendly), flush toilets and hot showers are located within the cabin village. Cabin camping is a great alternative to RV or tent camping, and the cabin village has the best view in the park. Firewood can be purchased in all camping loops and ice is available for purchase during summer months. Two meeting halls are available for rent for gatherings as well as the covered shelter at Hilltop Day Use Area. Reserve online today at www.oregonstateparks.org! A family rests at Beaver Pond before continuing on their bike tour through Stub Stewart Park. Mountain Bike Trails: Stub Stewart features one of the best mountain bike specific areas in the region and is being developed by volunteers. The entrance to the area has a kiosk which explains the risk and skill levels on the trails. The easiest level is a cross country trail – a single track which is being built by the Northwest Trail Alliance (NWTA). The highlight is the free ride area with beginner, intermediate and advanced trails. 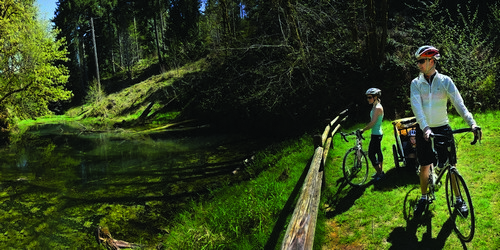 It is the first mountain bike free ride trail network sanctioned within an Oregon State Park and remains in development by the Westside Trail Federation with more trails and technical features added each season. Skills filters at the start of the trails allow riders to gauge their comfort level for the types of features they will encounter on the trail. The mountain bike trails are built away from the day use areas. 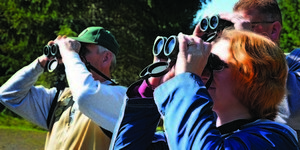 Trail Patrol volunteers provide trail etiquette and safety assistance for users. Trails: Over 30 miles of mixed use trails, great for hikers, bikers, and equestrian recreation, wind their way throughout the park. There will be continued trail work this summer; bridges are being installed as well as trail re-routes. Come explore the trails to experience the wildlife that calls Stub Stewart “home.” Hilltop Day Use area is the trailhead for all trails within Stub Stewart State Park, and provides a great view of the coast range! The Banks-Vernonia State Trail offers 21 miles of paved trail with access from trailheads in Banks, Vernonia, Manning, Buxton, Tophill, and Beaver Creek. Disc Golf: A challenging 18-hole, forested course is one of the top rated in the state of Oregon! The course travels through large, tall trees and features both professional and amateur baskets. 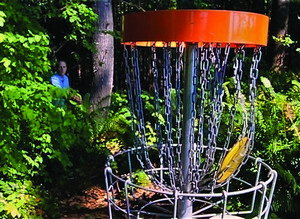 It is recommended to walk the course prior to playing to determine the basket placement. Disc Golf course maps are available at the Discovery Depot. A 3-hole mini course located between the camping loops acts as a casual starter course for all ages. Make sure to make a visit to Stub Stewart State Park part of your camping plans this year. You just might be surprised by what you find.